The provisional version of the 2014 MotoGP calendar has been announced and it's got a few surprises, or shocks, depending on how you look at it, in store for MotoGP fans. To begin with, the calendar of events has now reached a whopping 19 races, which will make the 2014 season the longest season in MotoGP's history. While 17 of this year's races will be a part of the calendar, two more events will be added - namely Argentina and Brazil. While it has been confirmed that Argentina will definitely be on the calendar, Brazil's spot on the calendar is currently 'subject to homologation'. Now for the bitterly disappointing news. 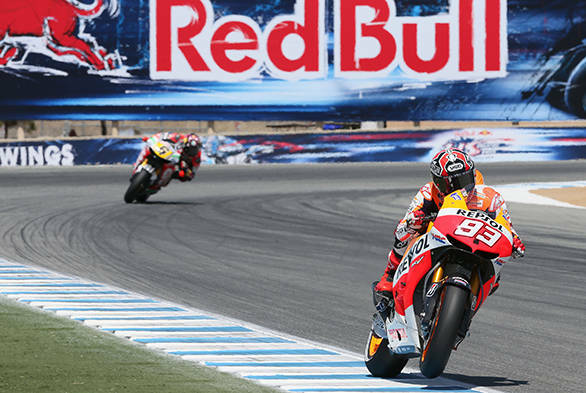 MotoGP fans won't get to see motorcycles racing down the famed Corkscrew in 2014. Laguna Seca has been removed from the calendar. An official press release issued by the Mazda Raceway Laguna Seca stated "For 25 years, Mazda Raceway Laguna Seca has served as the "home" for Grand Prix motorcycle racing in the United States, having staged 15 world championship Grands Prix since 1988. Unfortunately, and in spite of loyal support from fans, sponsors and media, there will not be a 16th U.S. Grand Prix in 2014. At this time, the U.S. is only able to support two MotoGP events. The support provided by the states of Texas and Indiana make it difficult for us, as a not-for-profit, to currently compete."